Today I’m moving away from water transfer for all those who can’t stand the mess or have little ones who are just not ready for that yet! This is the second Montessori style tray activity for toddlers that I ever introduced, to follow on from the mega marbles transfer. Both require less fine motor control and can be completed successfully by young toddlers. Easy to set up and adapt to the materials you have on hand, you can get this one together in minutes. A great highchair or table activity, it works well for keeping little ones occupied while homeschooling and can easily be carried to the Montessori mats traditionally used to delineate each child’s work-space. 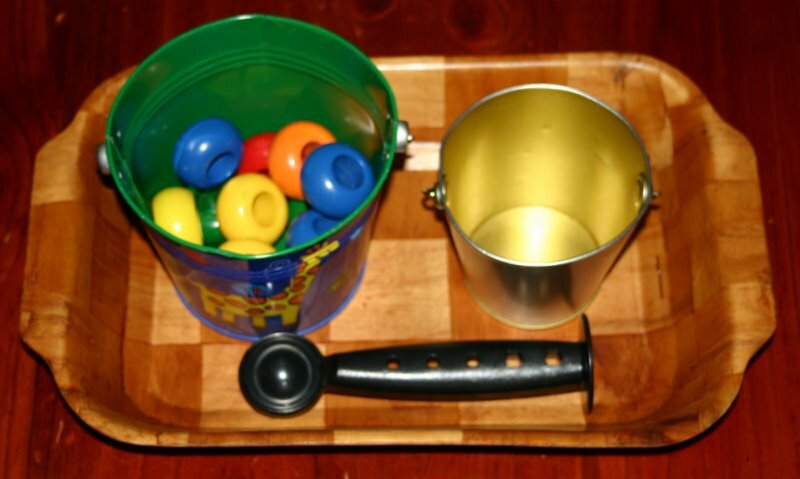 The child uses the scoop provided to transfer the large wooden beads from one bucket to the other and back again.